The Omega’s operating system (OS) is based on Linux, a popular open-source OS that powers servers and computers all over the world. The version on the Omega is a minimalistic and lightweight distribution called LEDE, which stands for Linux Embedded Development Environment. It supports many programming languages and and can run all kinds of complex projects while still being small enough to fit in the Omega’s memory. We interact and operate the Omega by using the command line interface (CLI). The CLI is the user’s access point into the operating system using a text-based terminal program. All user interaction is interpreted and executed by the OS through instructions, or commands. A user enters a command into a terminal to make something happen. The CLI can look something like the picture below. In this terminal program on Windows, the green box is where the commands you type will be displayed on the screen. In Linux, everything is a file. So naturally, the file system is where a great deal happens. The filesystem of LEDE is organized like a tree. At the very bottom of a tree is the root, and so it is with our filesystem. / is the universal symbol for the very bottom of the filesystem - the root directory. All the files that the OS has access to can be found under some directory under /. In Linux systems, ~ is an alias for the home directory, and can be used in scripts and programs. For example, calling a file in ~/myProject is equivalent to calling /root/myProject. 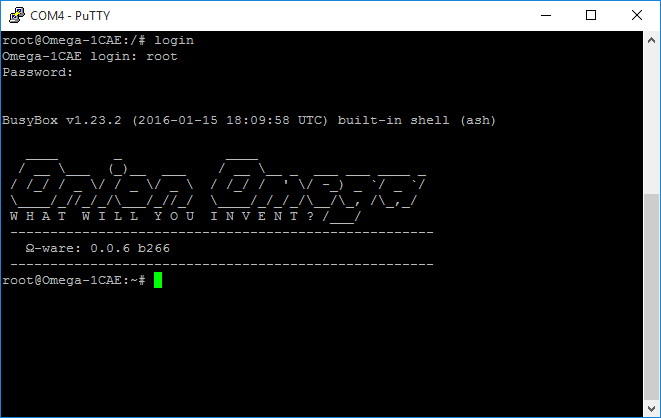 On the Omega, all the contents in the /root/ directory will be preserved through any firmware updates. So for our experiments, we’ll try to store our files in there so they stay put! Navigation usually consists of finding our location, looking for landmarks, and then setting a course for our destination. To that end, we’ll look at the pwd, ls, and cd commands to let us do just that. This tells us we’re in the /root/ folder, one level down from /. Notice that the prompt (all the things before #) already tells us where we are, the ~ is exactly our working directory /root. Now that we know where we are, we should take a look at our surroundings. To list out every file in a directory, the ls command is our go to. Awesome, now we know there’s four files in the working directory. But wait, there’s more! Not only can ls list the working directory, if we give it a path, it can also peek into that path. A path is the full location of something in the filesystem, starting from the root. The prompt tells us we’re still in ~, but those are folders in /. Of course we can’t stay in the same working directory forever. We can move around directories using the cd command. It stands for change directory. This command changes the present working directory to /root. Earlier, we mentioned the idea of a ‘path’ in passing. A path (or ‘absolute path’) is like the full address to something in the file system. For example, if you have a directory called kittens in your /root folder, the path of that directory is /root/kittens. Similarly, for a file called adorable.jpg in /root/kittens, the path would be /root/kittens/adorable.jpg. Typing out the full path everything can become tedious, so there are many shortcuts that cd can understand in the form of ‘relative paths’. There are some path aliases that change where it leads depending on the context. To go to the /root on the Omega (or the home folder as a different user) cd with no arguments will take us there. The relative path for the ‘directory above’ is .., so cd .. will take us up one level no matter where we are. To get to any sub-directories in the working directory, we can cd <name of directory> instead of the absolute path. All of the shortcuts above work with each other too! The first .. expands to ‘up one level’, and in that directory, .. again will of course take us back up once more. If we want to cd up and sideways into the kittens directory, we can use the path ../kittens - up one level, and into kittens below. Navigating is very useful, but doing things with files is what gets projects working! So to do that, we’ll go over commands to create and delete directories, and creating and removing files. We’ll cover the mkdir and touch commands to create things, and the rm command to get rid of them. If the file doesn’t exist yet, it creates an empty file. If the file already exists, it updates the time it was last modified to when you ran the command. -rw-r--r--    1 root     root             0 Mar 23 23:41 hello.txt    # the modified time updated! This means to go into a directory and delete all of the files inside. If it finds more directories, it enters them and deletes their contents as well. This is required when deleting directories, otherwise it will return an error. This will make the program continue if it runs into an error when trying to delete a file.